IC Insights will release its May Update to the 2018 McClean Report later this month. This Update includes a discussion of the 1Q18 IC industry market results, an update of the 2018 capital spending forecast by company, and a look at the top-25 1Q18 semiconductor suppliers (the top-15 1Q18 semiconductor suppliers are covered in this research bulletin). 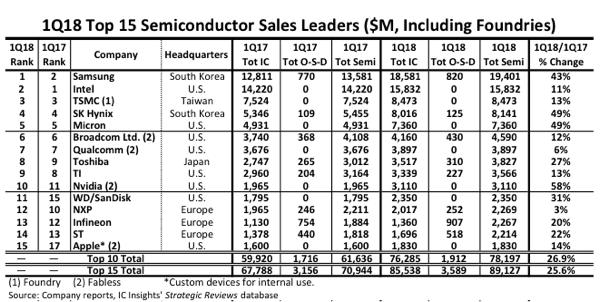 The top-15 worldwide semiconductor (IC and O-S-D—optoelectronic, sensor, and discrete) sales ranking for 1Q18 is shown in Figure 1. It includes eight suppliers headquartered in the U.S., three in Europe, two in South Korea, and one each in Taiwan and Japan. After announcing in early April 2018 that it had successfully moved its headquarters location from Singapore to the U.S. IC Insights now classifies Broadcom as a U.S. company. The top-15 ranking includes one pure-play foundry (TSMC) and four fabless companies. If TSMC were excluded from the top-15 ranking, Taiwan-based fabless supplier MediaTek ($1,696 million) would have been ranked in the 15th position. IC Insights includes foundries in the top-15 semiconductor supplier ranking since it has always viewed the ranking as a top supplier list, not a marketshare ranking, and realizes that in some cases the semiconductor sales are double counted. With many of our clients being vendors to the semiconductor industry (supplying equipment, chemicals, gases, etc. ), excluding large IC manufacturers like the foundries would leave significant “holes” in the list of top semiconductor suppliers. As shown in the listing, the foundries and fabless companies are identified. In the April Update to The McClean Report, marketshare rankings of IC suppliers by product type were presented and foundries were excluded from these listings. In total, the top-15 semiconductor companies’ sales surged by 26% in 1Q18 compared to 1Q17, six points higher than the total worldwide semiconductor industry 1Q18/1Q17 increase of 20%. Amazingly, the Big 3 memory suppliers—Samsung, SK Hynix, and Micron, each registered greater than 40% year-over-year growth in 1Q18. Fourteen of the top-15 companies had sales of at least $2.0 billion in 1Q18, four companies more than in 1Q17. As shown, it took just over $1.8 billion in quarterly sales just to make it into the 1Q18 top-15 semiconductor supplier list. Intel was the number one ranked semiconductor supplier in 1Q17 but lost its lead spot to Samsung in 2Q17 as well as in the full-year 2017 ranking, a position it had held since 1993. With the continuation of the strong surge in the DRAM and NAND flash markets over the past year, Samsung went from having 5% less total semiconductor sales than Intel in 1Q17 to having 23% more semiconductor sales than Intel in 1Q18! It is interesting to note that memory devices represented 83% of Samsung’s semiconductor sales in 1Q18, up six points from 77% in 1Q17 and up 12 points from 71% just two years earlier in 1Q16. Moreover, the company’s non-memory sales in 1Q18 were only $3,300 million, up 6% from 1Q17’s non-memory sales level of $3,125 million. As would be expected, given the possible acquisitions and mergers that could occur this year (e.g., Qualcomm/NXP), as well as any memory market volatility that may develop, the top-15 ranking is likely to undergo a significant amount of upheaval over the next few years as the semiconductor industry continues along its path to maturity. Additional details on current IC market trends are provided in the May Update to The McClean Report—A Complete Analysis and Forecast of the Integrated Circuit Industry. A subscription to The McClean Report includes free monthly updates from March through November (including a 250+ page Mid-Year Update, and free access to subscriber-only webinars throughout the year. An individual-user license to the 2018 edition of The McClean Report is priced at $4,290 and includes an Internet access password. A multi-user worldwide corporate license is available for $7,290.